(37x30) Mens Vintage 70s Wool Disco Pants! 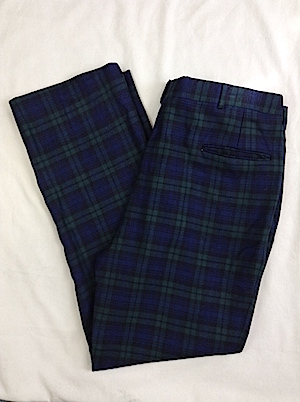 Green, Blue, Black Plaid! 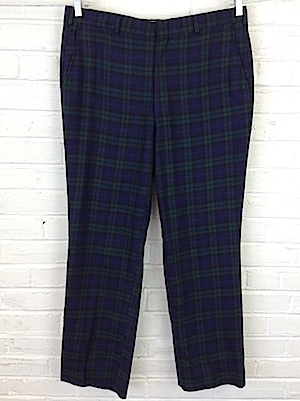 Home > Items just added 4/3-4/17 > (37x30) Mens Vintage 70s Wool Disco Pants! 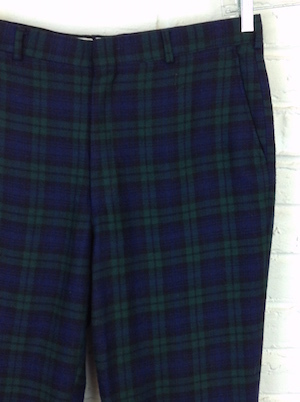 Green, Blue, Black Plaid! Mens vintage 1970s wool Xmas disco pants! Blue, green and black plaid. Closes in the front with a hidden tab closure and a hidden interior button for a more secure fit. Two side pockets and two inner pockets in the back one with a button closure. Bottom of the pants are cuffed. Pants are not lined on the interior. Tagged by Lord and Taylor. No material tag, but feels like 100% wool. Made in the U.S.A. Condition: Good++. Has few small holes on the right front pant leg. two towards the top and one towards the bottom. Still an amazing pair of disco pants. Priced accordingly. Rise (waist to crotch): 12"